Rating is 5 (based on 2093 reviews). The content here is a representation of our other NauticEd sailing courses. PLUS we've added a bonus Module 5 to discuss the highly relevant America's Cup Winged Sail configuration and its advantages with reduced drag and improved angle of attack using diagrams to help understand the force vectors. Whether you're learning to sail, or you're an advanced sailor, take this free mini course now - it will take you about 30 minutes to get through the material, I guarantee you'll learn something. The basic concepts of sail trim are explained using multimedia interactive html5 animation technology, meaning you'll have various trim controls at your mouse tip and you'll be watching wind effects right in front of your eyes on your computer screen. 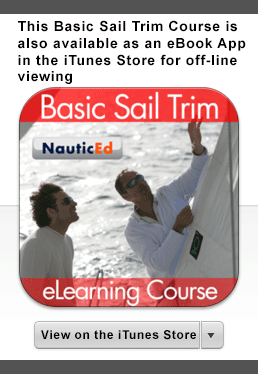 This Basic Sail Trim Course is also available as an eBook App in the iTunes Store for off-line viewing. It's the 21st century way of learning to sail. You'll fully grasp the concepts here using e-learning technology, then we encourage you to get out on the water with one of our professional affiliated sailing schools and practice with a proper understanding. You'll then save time with the sailing instructor on these basics and be able to concentrate on the more advanced sailing techniques. Using the interactive controls and animations, you'll be blown away (sorry for the pun) by your new understanding of this sail trim material and you'll no longer get frustrated when trying to explain the concept to others. If a picture is worth 1000 words then an interactive animation is worth infinity. And finally, if you skipper your own sailboat, you're probably pretty versed with the material here and ready for the most advanced NauticEd sailing school courses. But we suggest, at the very least, send your crew here to take this FREE Sailing Course. Then next time you go sailing, watch them make your sailboat go a knot or two faster. There is no other sailing course in the world that explains sail trim using such hi-tech e-learning methods. So grab a cappuccino sit back and watch sail trim unfold in front of your eyes. Then, once you've figured out that we're the best at explaining this stuff you might try some of our other sailing courses and start to build your globally recognized sailing resume and certifications. We've created an interactive animation here so that you'll instantly "get" what everyone tries to explain laboriously on a blackboard without much success. Click and drag on the slider bar. As the car speeds up, the wind increases in velocity and the direction of origin feels like it moves forward. That's apparent wind - it's what your hand feels out of the window and on a boat it's what the sails feel. If you stop the car, the apparent wind goes back to be the same as the true wind. The true wind stays the same regardless of your speed. That's it! Now you understand true versus apparent wind.